Having a nice outfit paired with your designer bags and expensive shoes can best be completed by simply wearing accessories. Rings, bracelets, necklaces and wrist watches are some of the accessories that can instantly add life to your daily outfit. Accessories come in all forms, shapes, and colors. You just need to choose which one suits your attire and perhaps personality as well. Learning how to accessories can do wonders to your daily outfit. Imagine a plain tee top with a necklace with vibrant colors can easily make your outfit look more interesting. Accessories like necklace can instantly turn a boring outfit into an interesting one. A necklace is a favorite piece to many because they come in different styles. Although necklaces are readily available in the market, creating your own design is also possible. It’s easy to fall to the accessories being sold almost everywhere because it is not time-consuming. Creating your own accessories will help you express your personality. There are many sources of DIY idea including the internet and magazines. Different blogs and websites and even mobile applications have many DIY Necklace Idea. The good thing about DIY necklaces is that they are easy to make. Step by step instructions can be found online or in the magazines to help you to create a beautiful piece. Another benefit of DIY Necklaces is that it saves you money. You can make new necklaces using old materials that you already have. All you need is your creativity to come up with a good design. Another good thing about DIY necklaces is that you can sell it to your friends or give it to them as a gift. There is nothing more meaningful than a personally made necklace. DIY Necklaces is also helpful to the environment. Instead of throwing old necklace chains, you can just clean and re-use them. Instead of adding up to a pile of garbage, materials are being recycled, thus helping to save our mother nature. So how do we start doing DIY Necklaces? First is to gather the materials. Check your accessories and decide which materials will be good to use in creating new necklaces. The second step is to unleash the artist in you. Doing your own necklaces is an art. You just need an inspiration and creativity. Browse through the internet and read different books and magazines that focus on DIY accessories. Below are some of the DIY Necklace Idea that you can try. Quartz and gold will help you achieve a chic look. It looks good with a tube top or other tops with a low neckline so as to highlight the quartz. You can use this necklace for work and even for formal occasions like weddings or prom. 1. Cut the beading wire and make a loop on one end. This will prevent the beads from falling out from the metal wire. Woven chain necklaces are fun to include in your outfit. There are so many different colors to choose from depending on your fashion taste. You can use a woven necklace over a nice dress to create a laid back look. There is a saying that diamonds are a girl’s best friend. But not anyone can have the chance to have a real diamond in their lifetime. So the best way is to improvise. This necklace is recommended for teenagers and those who are young at heart. It creates a bubbly and carefree look. Using fancy stones for your necklace creates a fun and interesting personality. It is best to use over a plain shirt or blouse because the gems alone a fashion statement on its own. Stay away from printed materials because doing so will overdo your look. Beads are one of the accessories that have been used for so many years now. It is inexpensive and readily available on the market. Bead necklaces can be used over a plain blouse or shirt especially if you are using colorful beads. It makes you look fresh and young. 2. Add the crimp bead and the jump ring. Loop the string over the jump ring. 4. Use the smallest jump ring to attach the chain to one side of the necklace. Use the medium jump ring to the small piece of chain. Attach the lobster claw on the other end. Pistachio nuts are delicious! What’s good about it is you can convert the shells into a unique necklace. You can use it over a dress for that a-walk-in-the-park peg. This necklace looks very creative and is environment-friendly as well. Using beads and safety pins as a necklace pendant is a creative and unique idea. You can play with different bead colors to unleash the creativity in you. You can wear it over a plain top paired with a long bohemian-inspired skirt. Colorful necklaces in different shapes can best be worn over a plain top or dress with minimal details. Vibrant colors can also symbolize a bubbly and interesting personality. Always choose colors that match your personality. 2. Arrange the tiles on top of the stiff felt and make an outline using the marker and cut the prepared outline. Feather pendants look very classy. Wearing one can easily create a vintage inspired look. Feathers, when wrap with colorful fabric scraps can create a more youthful outfit. This can best be worn over your favorite tank top and a colorful cardigan. It easily creates a sweet and demure image. 3. Attach your jump rings on both ends of the feather and attached it to the chain. Use the clasp at one end of the chain and another jump ring on the other end. What’s good about polymer clay is you can mold it in different shapes and you can even mix it with other colors. Wear it over a tube or tank top to create an adventurous personality. 1. Roll the clay in between your hands until soft. 2. Place one color of Polymer clay over the other color. Pinch or kneed the clay until the colors have combined and they look like just one piece of clay. 3. Shaped the clay into triangles until you achieve the desired thickness. Use a toothpick or a needle to create a hole on both ends of the triangle. 4. Attached the jump string on each hole and attach it to the chain. 5. You may also create a triangle using just one color of polymer clay. Using leather chains create a sophisticated look. You can choose any shape of metal as your pendant. This necklace would look good with smart casual attire. 1. Create a girth hitch knot by passing the folded end of the leather lace through your cut metal shape and thread the other end of the leather lace through the loop and tighten it. 2. Do the same girth hitch know on the other end of the lace. 3. Join the metals cuts using jump rings. 4. Attached the jump ring to the string of metals you have created earlier. 5. Close the necklace by tying each pair of lace to the other pair using an overhand knot. A simple DIY that is also inexpensive. 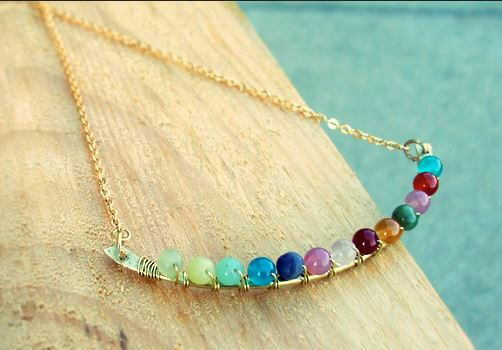 This colorful necklace would look good with almost everything. Wear it on your plain tees, Sunday dress or even your office uniform. 1. Cut at least 3 inches from the thick wire. Hold one end of the wire and hammer it down until it is flat. 2. Make a hole on bothe ends of the hammered wire using an ice pick or anything with sharp ends. 3. String the beads using the thin wire. Wrap the end around one end of the hammered wire a couple of time until it is secure. 4. Attached the jump rings to both ends of the pendant and attach to the chain. This necklace looks very organic and would look beautiful over clothing with very minimal designs. If your goal is to make a plain outfit stand out, then this is the perfect DIY necklace for you. 1. Use the hammer to pound the glass. You may put the glass in Ziploc plastic bags to prevent injuries and to keep the hammered glass n place as well. Using straw as one of the materials of your pendant is a good way to recycle and save the environment. Plastic straws may look cheap and spraying it with a gold paint can make it look classy. It would look best with your plain tank top or loose shirt. Using penny pasta as your pendant is a good way to show your creative and unique personality. Paint it with pastel colors to create a feminine look. This colorful necklace reminds me of Lego pieces. It is very colorful and is perfect for those who are adventurous and is up for any challenges. Use it over plain blouses so that it stands out. Using duct tapes as pendants is a great way to show your funky side. Pair it with a gold necklace chain to add a classy look. Using buttons of different colors would make a cute DIY necklace. Wearing this necklace would bring out the youth and innocence in you. It represents a carefree but interesting personality. This will look good with plain t-shirts since the pendant is already colorful. Fringe accessories are all part of the 70’s fashion. If you were not born during this time, then now is the best time to try wearing a fringe necklace. A casual outfit will look all dress up by just using a fringe DIY necklace. 1. Measure 3×8 inches on your leather and cut it. Lay the leather on the cutting board. Use your knife to create fringes and keep them at least 1/4 inch apart. Button necklaces covered in colorful fabrics is a trendy way to show your unique character. It is a simple DIY necklace that looks good with pretty much everything.